Dive Friends Bonaire, a PADI 5 Star dive operation, has a gear rental and gear storage room on property. They also have a drive up tank access area just off our parking lot plus a second tank area for shore diving our house reef and for boat dive departures. Tanks are available 24/7 from both area with free upgrades to Nitrox for Nitrox certified divers. Dive boats depart at 9:00 am for morning 2-tank dives. The boats go to Klein Bonaire five days a week, but on Wednesdays and Saturdays they generally head north to dive sites you cannot reach from shore . You’ll be back in time for lunch and then you can take advantage of unlimited shore diving for the rest of the day, or if there are at least 2 divers signed up, you can do a 2:30 pm one-tank afternoon dive to Klein Bonaire. Night dives may be scheduled with a minimum of 2 divers. 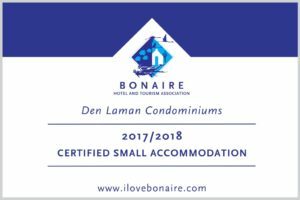 In addition to having Dive Friends on-property facilities at their disposal, Den Laman guests have the added benefit of being able to swap out tanks for shore diving at any of Dive Friends existing 6 dive facilities: Den Laman, Yellow Submarine, Dive Inn, Port Bonaire, Hamlet Oasis and Courtyard by Marriott.